The Blue Mesa Reservoir, which feeds into the Colorado River, is at 39 percent capacity, according to the Bureau of Land Reclamation. The last time the reservoir west of Gunnison was at a similar level was in 1987, said Sandra Snell-Dobert, a spokeswoman for the Black Canyon of the Gunnison National Park and Curecanti National Recreation Area. Low water levels and rising temperatures also have allowed for blue-green algae blooms. Although no direct environmental impacts have not been observed, some species of this algae can produce toxins that are harmful to dogs. The Gunnison River Basin varied between 50 percent and 80 percent of its average snowpack this winter, hitting a low of 51.6 percent Dec. 20 and a peak of 79.81 percent April 20. Other Colorado River reservoirs are facing similar shortages. Lake Powell and Lake Mead in Arizona dropped to dangerous levels this week because of what scientists are calling the effects of the Colorado River’s worsening “structural deficit,” The Associated Press reported. Lake Powell and Lake Mead hit 48 percent and 38 percent capacity, respectively. The Colorado River basin, which feeds lakes Mead and Powell, has been drying out over the last two decades, scientists said. With the demands from farms and cities exceeding the available water supply, the strains on the river and reservoirs are being compounded by growing population, drought and climate change. The Colorado Division of Water Resources reports the basins were 50 percent full at the end of August, in contrast to last year’s 120 percent average capacity. The average for this time of year is about 82 percent. The last time water levels were this low on the reservoir was in 1987, Snell-Dobert said. Blue Mesa usually only closes if there’s not enough staff or if the reservoir freezes. The reservoir levels now have also caused some abnormal boating hazards. “Mostly it’s rocks that are becoming exposed as the water level decreases. There are a lot of rock promontories and islands, and those kinds of things that we haven’t seen in a long time,” she said. But despite the boating restrictions, Snell-Dobert said shoreline fishing, kayaking, canoeing and other hand-launched, non-motorized boating are still allowed at the reservoir. A hydropower generator in a powerplant. The Bureau of Reclamation has launched a new prize competition seeking solutions to provide direct current power of up to 20 watts for electronic instruments on hydropower generating units’ rotating shafts. 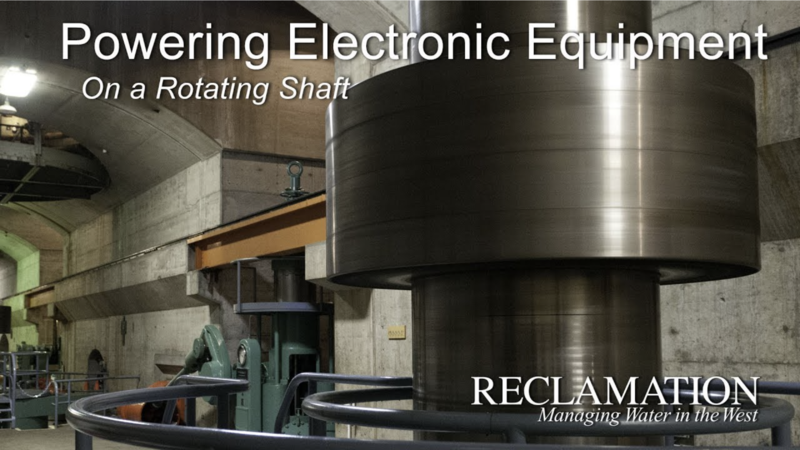 Power sources for electronics on rotating shafts presently available include batteries and contact solutions. However, existing technologies for these types of power sources are limited with respect to operation, installation, maintenance or other factors. Thus, new solutions are needed to power these instruments, which will be installed permanently on the rotating shaft to collect continuous data of generator operation and performance. Reclamation is the second largest producer of hydropower in the country, operating 53 power plants. The generating units at these plants are expected to safely and reliably produce the power that is delivered to the western electric grid. Monitoring the generating units is a critical advancement toward keeping these units operational. Submissions for this competition must be submitted by 11:59 p.m. EST on December 8, 2018. Reclamation is partnering with the U.S. Army Corps of Engineers and Bonneville Power Administration on this prize competition. To learn more about this prize competition and other competitions Reclamation has hosted, please visit https://www.usbr.gov/research/challenges/index.html. Click here to read the report about progress and lessons learned since the September 2013 flooding up and down the Front Range. The White House on Friday announced plans to appoint Jayne Harkins, executive director of the Colorado River Commission of Nevada, to head the U.S. side of the cross-border treaty organization. Harkins said she was recommended for the post by Sens. Catherine Cortez Masto, D-Nev.; Dean Heller, R-Nev.; Cory Gardner, R-Colo.; and John Barrasso, R-Wyo. 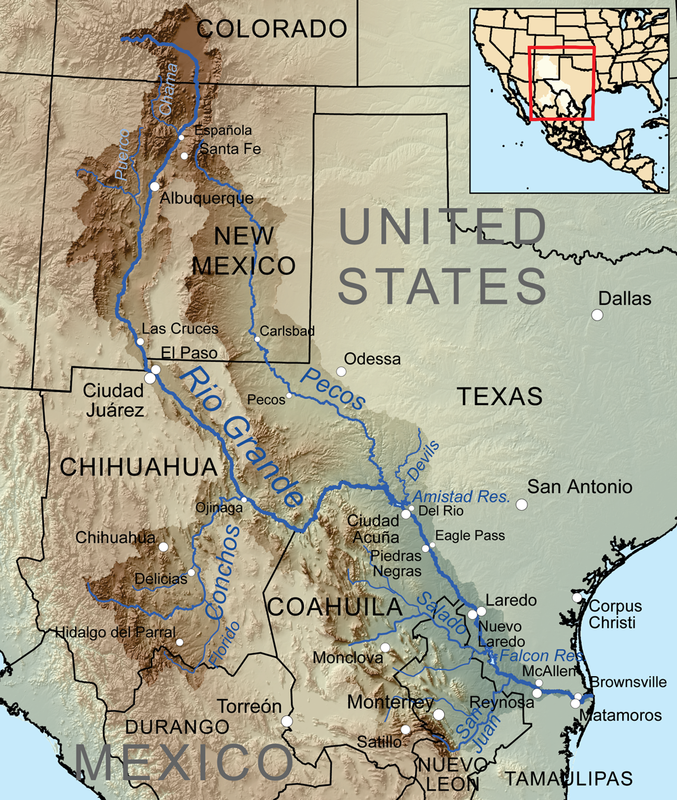 The International Boundary and Water Commission regulates such thorny issues as the location of the border and the allocation of water in the Colorado and Rio Grande rivers. The commission also oversees flood control, sanitation and other water quality issues impacting the two nations. Harkins has held the top job at the state agency responsible for managing Nevada’s water and power resources from the Colorado River since 2011. During that time, she participated in international talks that led to a series of agreements over Mexico’s use and conservation of water from the Colorado. Before that, the registered professional engineer spent 27 years with the U.S. Bureau of Reclamation, where she eventually served as deputy director of that agency’s Lower Colorado River Region. Harkins said her appointment is expected to become official in a few weeks, after which she will report for work at the boundary and water commission’s U.S. headquarters in El Paso, Texas. The Mexican section of the commission is located in the neighboring city of Ciudad Juarez, Chihuahua. The Colorado River is the primary surface water resource in the rapidly growing U.S. Southwest. Over the period 1916‐2014, the Upper Colorado River Basin naturalized streamflow declined by 16.5%, despite the fact that annual precipitation in the UCRB over that period increased slightly (+1.4%). In order to examine the causes of the runoff declines, we performed a set of experiments with the Variable Infiltration Capacity (VIC) hydrology model. Our results show that the pervasive warming has reduced snowpacks and enhanced evapotranspiration (ET) over the last 100 years; over half (53%) of the long‐term decreasing runoff trend is associated with the general warming. Negative winter precipitation trends have occurred in the handful of highly productive sub‐basins that account for over half of the streamflow at Lee’s Ferry. We also compared a mid‐century drought with the (ongoing) post‐Millennium Drought, and find that whereas the earlier drought was caused primarily by pervasive low precipitation anomalies across UCRB, higher temperatures have played a large role in the post‐Millennium Drought. The post‐Millennium Drought has also been exacerbated by negative precipitation anomalies in several of the most productive headwater basins. Finally, we evaluate the UCRB April‐July runoff forecast for 2017, which decreased dramatically as the runoff season progressed. We find that while late winter and spring 2017 was anomalously warm, the proximate cause of most of the forecast reduction was anomalous late winter and early spring dryness in UCRB, which followed exceptionally large (positive) early winter precipitation anomalies. Since 2000, the amount of water flowing in the Colorado River has dropped 19 percent below the average of the past century, a decline that has left the Southwest on the brink of a water shortage. Now, new research indicates that a large portion of that decline isn’t due to less rain and snow falling from the sky, but to warmer temperatures brought on by climate change. Scientists from the University of California-Los Angeles and Colorado State University found that about half the trend of decreasing runoff from 2000-2014 in the Upper Colorado River Basin was the result of unprecedented warming across the region. Udall, together with UCLA researchers Mu Xiao and Dennis Lettenmaier, used a hydrologic model to examine the streamflow in the Upper Colorado River Basin from 1916 through 2014. They found the flow declined by 16.5 percent over the past century. They calculated that 53 percent of the trend was linked to warming, which has shrunk the average snowpack in the mountains, boosted the uptake of water by plants and increased the amount of water that evaporates off the landscape. The researchers attributed the remaining 47 percent of the decrease in the river’s flow to shifts in precipitation patterns, with less rain and snow falling in four areas of Colorado that tend to be especially productive in feeding tributaries in the Rocky Mountains. For you geeks: Here’s the link to the Variable Infiltration Capacity (VIC) Macroscale Hydrologic Model download and docs. Warming temperatures throughout the Colorado River watershed accounted for more than half the decline in flows, Udall says. Other factors include changes to precipitation patterns and loss of snowpack in high altitudes. “The impacts of temperature are very large on this river and if you believe temperatures are going to increase — as every reputable scientist now does — you then have to conclude that the future of the river is going to be a future with much less water in it,” Udall says. The amount of precipitation increased by about one percentage point during the last 100 years, but it didn’t end up in areas that would boost the river’s flow in significant ways. Udall says most water managers agree that climate change is fundamentally altering how the river functions. Officials in Arizona, California and Nevada are currently negotiating a new plan to voluntarily cut back how much water they take from the river to avoid mandatory reductions. Federal officials have given the states until the end of the year to craft a plan. The latest study builds on a 2017 study Udall published with University of Michigan researcher Jonathan Overpeck that compared flows in the Colorado River during a period of hot and dry conditions in the basin starting in 2000 to long-term average flows. From 2000 to 2014 flows in the river averaged 19 percent below those recorded the previous 93 years. He notes too that the current drought conditions in the basin differ from droughts in the recent past. An extended drought from 1953 to 1968 was mostly driven by lack of precipitation, whereas the 21st century drought is being driven by increasing temperatures, a product of climate change. Lake Powell cannot rescue Lake Mead forever, said Karl Flessa, a University of Arizona geosciences professor who worked on the report [From the Colorado River Research Group, It’s hard to fill a bathtub when the drain is wide open: the case of LakePowell]. “Those of us here in the Lower Basin are so focused on Lake Mead, but what’s propping up Mead is Lake Powell, and Lake Powell is going down, too,” Flessa said. A total of about 11 million acre-feet of the extra water has been sent from Powell to Mead since 2000, the report says. That’s more than seven years’ worth of CAP water. Powell has dropped 94 feet since 2000. Had all that water stayed in Powell, that lake wouldn’t have dropped at all since 2000, the report says. “The math suggests that, without these extra releases, we could today have a full Lake Powell and an empty Lake Mead. We are certainly not saying that would be a ‘better’ outcome; that would be chaos,” said another researcher involved in the report, Douglas Kenney, director of the University of Colorado’s Western Water Policy Program. The scientists say “the status quo (of reservoir management) is untenable,” and that a crisis on Lake Powell may already be at hand. “It is impossible to keep a bathtub full while the drain is left open,” the report says. It’s hard to fill a bathtub when the drain is open; it’s even harder when the tub is shaped like a bowl said Doug Kenney, who led the Colorado River Research Group study. He said visitors to Lake Mead and Powell who measure the water levels by the bath-tub-like rings on the canyon walls see only part of the problem. Lake Mead is currently only 38-percent full, but draws its water from Lake Powell, which was last measured as 48-percent full. [Hoover] dam is a proud place, built by thousands of hands and with 5 million barrels of concrete. Its golden elevator doors, Gotham-esque pillars, and stoic guardian angel statues line the lofty walkways atop the structure. A U.S. flag beating patriotically over the desert gets swapped out every few days, and then put out for sale in the visitor center. Yet, in the 80 years since the great dam’s completion, the 1,450-mile Colorado River – which sustains some 40 million Americans in places like Phoenix, Las Vegas, and Los Angeles — has been gradually growing weaker, and the water level beyond the noble dam has fallen considerably over the last two decades. The writing is easily spotted on the steep rocky walls of the Lake Mead reservoir, where a bathtub-like ring shows where the water once sat during more fruitful times. Today, however, the water sits 150-feet below that line, and human-caused climate change is a major reason why. Over the last century, the river’s flow has declined by around 16 percent, even as annual precipitation slightly increased in the Upper Colorado River Basin — a vast region stretching from Wyoming to New Mexico. New research published in the journal Water Resources Research argues that over half of this decline is due to sustained and rising temperatures in the region, which ultimately means more water is evaporated from the river, diminishing the flow. But it’s really been in the last twenty years that matters have deteriorated into a major drought, edging the region toward a potential water-rationing crisis. It’s the worst drought in Colorado River history. “The river since 2000 has been in an unprecedented decline,” Brad Udall, coauthor of the new study and senior water and climate research scientist at Colorado State University, said in an interview. “There’s no analog, from when humans started gauging the river, for this drought,” said Udall. 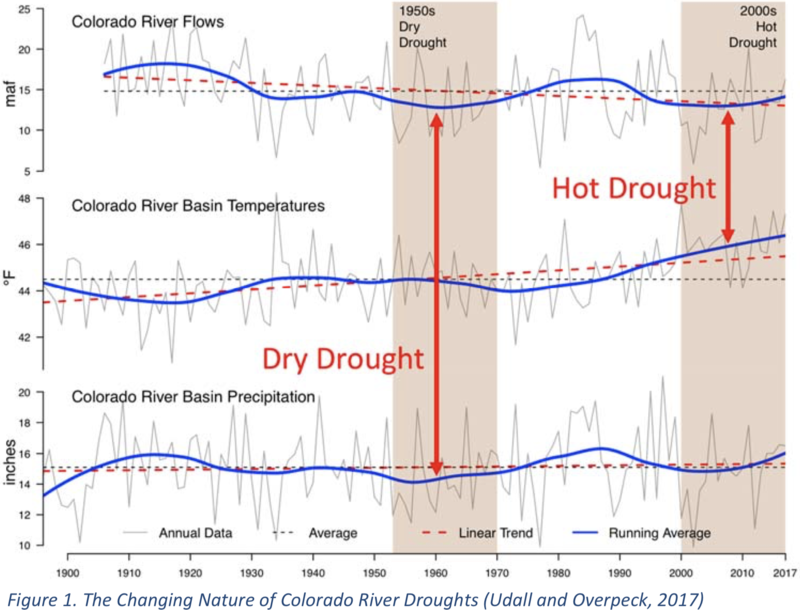 a new study shows that even though annual precipitation increased slightly between 1916 and 2014, Colorado River flows declined by 16.5 percent during that same time period. That’s thanks, in large part, to “unprecedented basin-wide warming.” Warming reduces snowpack and increases the amount of water plants demand. Using experiments and a hydrology model, the trio of authors from the University of California-Los Angeles and Colorado State University, found that 53 percent of the decrease in runoff is attributable to warming; the rest to reduced snowfall within regions that feed into the system. One of the study’s authors, Bradley Udall, co-authored an earlier paper with Jonathan Overpeck showing a drop in river flows. What’s striking about the new study, Udall explained, is how much of the decline is due to warming relative to precipitation. He cautioned that the study’s results are based on one model and one data set. In short, he said, the model points toward the further aridification of the region. The model also shows how sensitive the Colorado River Basin is to shifts in precipitation patterns. Not only does it matter whether precipitation falls as snow or rain, it matters where it falls. Snowfall in Colorado, he explained, contributes more to the river’s flows than if it falls in Utah. 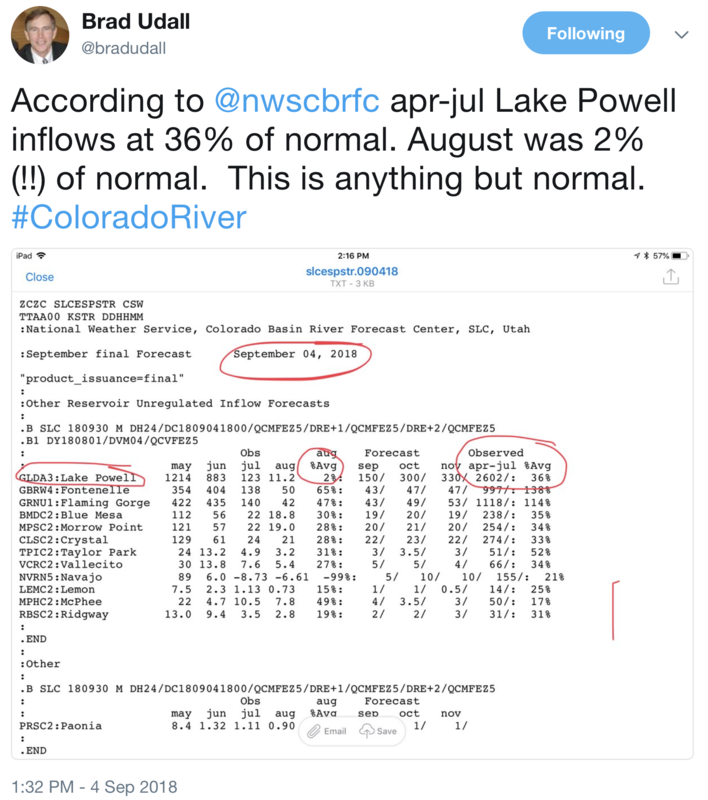 Unfortunately, the researchers noted a decline in snowfall within four important sub-basins of the river, all within the state of Colorado. The paper, he said, is also a reminder that we need respond to climate change right now.